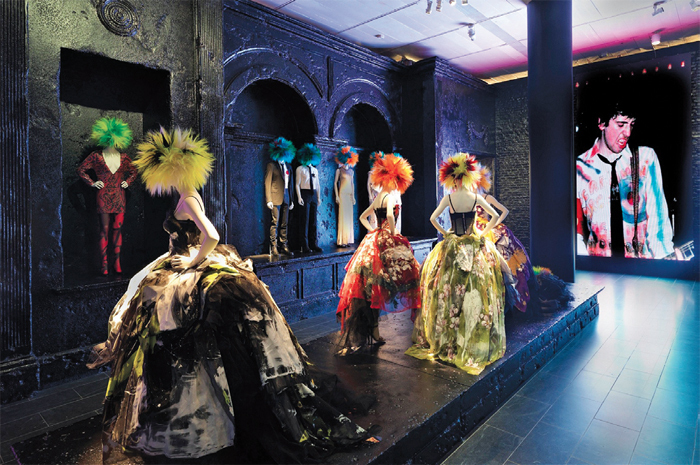 View of “Punk: Chaos to Couture,” 2013. I basically have no real relationship with punk because (a) I was too young for its initial moment of truth, and (b) it’s so not my style. I remember buying those albums from the alternative record store when I was in college. I wanted them, but I didn’t want to listen to them. But punk is so transhistorical now; is it possible to pry punk sensibility, which is essentially timeless, from punk as a music lifestyle with material and historical specificity? Now, if I say, “You’re so punk rock,” I am being derisiveit’s like saying you’re so not punk rock; you’re so bourgeois. This doubling of negatives ran through “Punk: Chaos to Couture,” curated by Andrew Bolton for the Met’s Costume Institute, revealing an unstable moment in which the museum attempts to both display and digest the effects of an antiauthoritarian subculture.